Home » advertisements , hypermind , The Knight Shift » New sponsor: HyperMind, for all your gaming needs! New sponsor: HyperMind, for all your gaming needs! The Knight Shift is proud to welcome a new advertiser, and if you've been a longtime reader you'll already know something about HyperMind. A positivalutely abundawonderful game store in Burlington, North Carolina, owners Nick and Denise Shepherd have established a place that draws loyal customers from as far away as Virginia, Raleigh/Durham and Winston-Salem. And by "games" we're talking about the old-fashioned stuff that doesn't require batteries or a specialized console... but does require you to play with others and have fun. Whether you're looking for time-honored pastimes like Monopoly and Risk, or new classics such as The Settlers of Catan, HyperMind has something for everyone. They also stock a healthy amount of miniatures-based games (including my current drug of choice, X-Wing Miniatures). One of the biggest sellers is perennial favorite Magic: The Gathering. And HyperMind goes all-out to provide for its devoted players, with an ample stockpile of cards (just about every kind of current booster pack you can think of) and a huge room serving as a place of casual play and weekly tournaments. Role-playing games such as Dungeons & Dragons are also a favorite. If they don't have it on shelves, the folks at HyperMind will gladly order it for you. 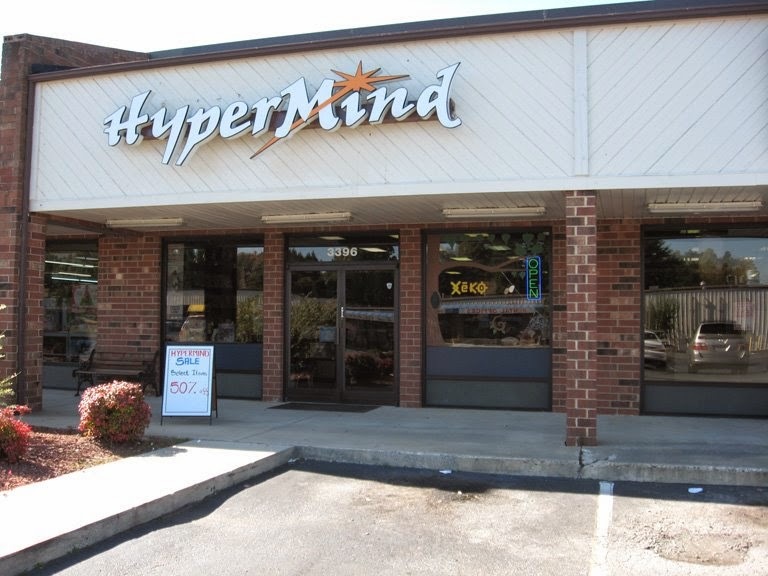 Serving the Triad area since 2006, HyperMind is an experience that you will want to return to again and again. Stop by today, and discover the fun!